"Okay, we know that the Zune doesn’t beat the iPod where it matters (sales) so this is sort of like BetaMax/VHS but the Zune really is an increasingly impressive device. I’m beginning to wonder if it’ll become the cult device that is sort of cooler than the iPod but not as popular. Sound familiar?" 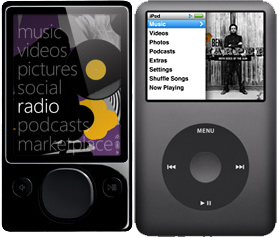 Jeff Blankenburg shares his thoughts on why the Zune is better than the iPod (seriously) and they're all important. He's got all the usual suspects (Zune Pass, FM radio, wireless sharing and syncing) but also mentions a few others, like Zune Originals, the consistently updated firmware, and how anyone can make games for their Zunes. Click through to see each of these points discussed in depth, and maybe pass it on to your "iPod owning uncle" at Christmastime.